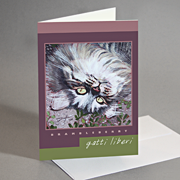 This painting of Brambleberry is the fourth in my series of “Gatti Liberi” (Free Cats—or strays as we often think of them). He was the first of the Free Cats to visit me regularly. He was shy, but tough. It wasn’t until he met my daughter that he allowed himself to be held and cuddled. Once he became comfortable around me, Brambleberry taught me something I should have learned long ago: to just lie back and watch the clouds go by, which is what he’s doing here. He has a Beethovenesque seriousness about cloud watching. Brambleberry disappeared about 5 years ago. His spirit companion, who arrived about the same time as he did, is Snowberry, who still visits me each day. This entry was posted in cat, gatti liberi, Painting and tagged kitten, kitty, stray on June 16, 2014 by mikedaymon.